How to draw and paint Mech robot scout. Learn to draw and paint mech robot Video and step by step tutorial. In this tutorial you will learn how to design Mech or Mecha robot android scout type for concept art or sci-fi illustration. A step by step images will also help you along while watching the video instruction. Whenever I want to start to come up with concept idea, I usually do this speedpainting concept spend about twenty minutes to an hour to get the concept down. You can watch and learn my process of how to put rough idea onto the paper sketching and create sci-fi mech robot concept art online lesson for comics cartoon illustration, manga, and anime. Here is a final quick sketch of the Mech robot scout. Watch the video tutorial how to draw Mech robot scout part 1. Watch the video tutorial how to paint Mech robot scout part 2. 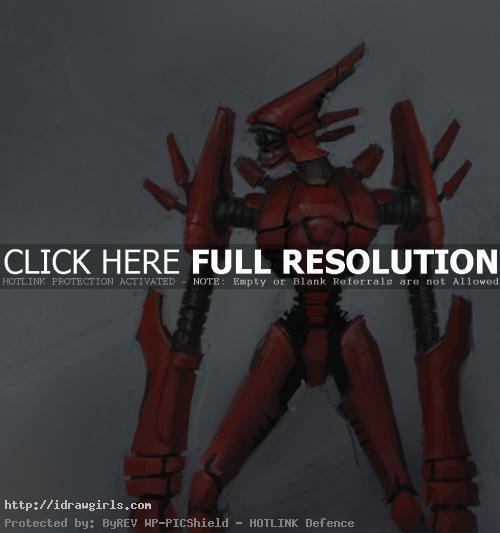 Below are step by step images draw and paint Mech robot scout process. Step one, I just draw random shape with the idea of making it a robot’s head. Step two, once I decided on the head’s shape then I continue to sketch the body shape out. Step three, I decided to go with the slim and slick body type and now I can paint in medium gray for its silhouette. Step four, I pick color red and start render the head of the robot using typical light source. Step five, I slowly paint the robot to make the material looks like coated metal. Step six, I get up close to continue painting the torso and the rest of the body. Step seven, then I continue painting the right arm using the same color and try to maintain the same reflection of the material on surface. Step eight, I continue on to the lower body and legs. And finished it up. More mech robot drawing tutorials. I’m a 12 year old and I’m hoping to become a professional artist/animator one day… you’re a GREAT inspiration. I have a cintiq wacom, and even with that I can hardly find fitting color techniques. So… yeah this looks like it could really help. Thanks for sharing! use a few layers at the time then I merge them all. Focus on value (light and dark). Be honest and trust your eye because your brain will tell you otherwise. Draw what you see, not what you think the object should look like. I am have painted/drawed for 2 years now, and still struggle with highlighting. Do you have any videos on idrawgirls.com that you could show me about highlighting and maybe shadowing? With or without colors?